We didn’t know it at the time, but Dennis grew up literally three blocks away from us in the Bronx. That alone is such an important and specific thing; people from the Bronx already understand each other. Because we’re from the same place, we grew up understanding the same problems and we probably know a lot of the same people—even today. That’s always made us immediately able to relate; it was a language to talk to one another. That was really important because we were building a relationship, and relatability is key. If it wasn’t for that, it’s hard to think whether the mentorship would have been the same. That kind of comradery probably wouldn’t have existed. We’re legit friends, so we took what he was teaching us more seriously because we cherished a relationship that taught us so much. Dennis taught us how to finish and arrange records and all the basics of how to make a track, beginning with the first one of ours that ever came out. “My Rendition” was basically just a demo that we did straight off of our Roland Fantom keyboard. At the time we were making music with no expectations and simply just for fun: it was about trying to make and recreate music that we loved at home. It wasn’t until Timmy Regisford played it out that we realized that it actually sounds dope in the club, so we should probably put it out. It was still a very rough draft and not finished at all, so we took it to Dennis and that’s when we really had our first crash course in finishing our own music. He literally sat us down at the computer and said, “Do this; do that.” It’s hard to describe what he taught us, because he taught us everything and anything you really needed to know: mixing down; EQing; arrangement techniques. He’s such a whiz and such a gearhead. It’s incredible—he’s a human encyclopaedia of production. The guy is a straight-up nerd. It was a crazy musical experience, and ever since we’ve kept building on the principles he instilled in us. Looking at what Dennis was doing in the studio, we realized that we had to sharpen up—and quick. Everything was happening all at the same time. We were learning how to make music while starting to DJ out and get some popularity in the deep house scene in NYC, so there was no time to waste. It was now or never. But he was also always very patient. We were making tracks all the time, and he would immediately tell us, “Yo, this is wack. Go back.” It wasn’t an attitude of “Put this out and hurry up!” He never rushed us when it came to the tracks because he knew you’re only as good as your last record. It was our own drive that made us want to get tracks done fast and get stuff out there. His mentality was to take time and get it right. We were in the studio with him every weekend and sometimes we would just pop up and be like, “Yo, Dennis, we’re outside.” At the time he was working on an album, The World As I See It, and we even played percussion on some of the tracks. Just watching the process of him making that record and the remixes he was doing at the time for all these other big records helped us so much. Dennis’s famous line to us was always, “You’re only as good as your last record.” You can only be as good as your last joint. Unless a record is a super-hit, you’re only going to remember the last one. It means that you always have to challenge yourself to one-up yourself. When we would play DJ sets he would tell us, “The day you’re at 50 percent has to be better than someone else’s 100 percent.” He instilled in us the mindset that we always had to be better. This attitude is now deeply entrenched, and it’s not going anywhere. His work ethic was crazy; he was just always on. The dude wouldn’t stop. We would be up for hours and hours until the sun would come back up, making music. Even now, I don’t think we can say that the mentorship has ended. He’ll always have something new to teach us and will always lend his knowledge to us. He’ll always be a mentor—that’s never going to change. But at the same time, we took what he taught us and we just ran with it. It wasn’t like we were just going to stay in that same moment; we had to grow and we had to leave that shell and also learn things for ourselves and come up with our own ways of doing things. You learn all the rules, and then you learn how to break them and do your own thing. Everything he taught and teaches us is forever there, but we took what we taught us and made it our own. And it’s great that now when we show him tracks he’s like, “What the hell? What did you use there?” or “What did you do there?” It comes full circle. But, honestly, as far as his knowledge and expertise in the studio and attitude to it all, I don’t think we will ever surpass him. That head of his is just too big. 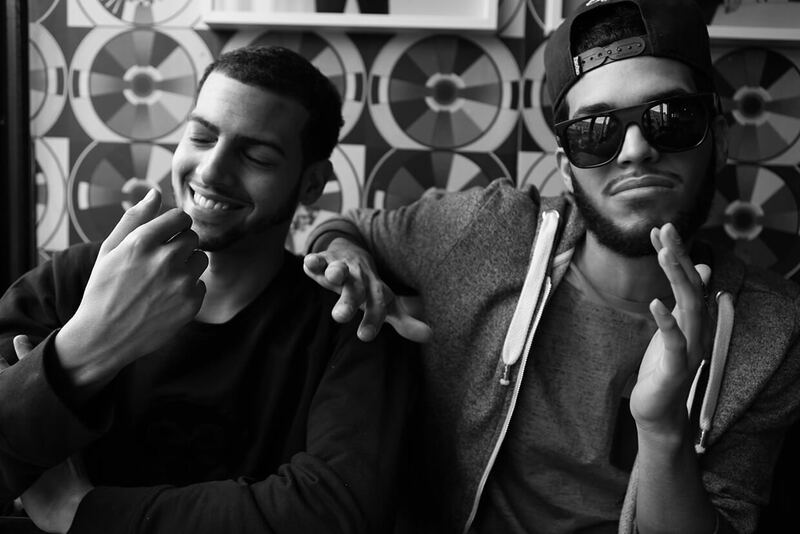 Check out The Martinez Brothers’ new single with Miss Kittin, “Stuff In The Trunk”, on Beatport. Read past mentors columns with Stacey Pullen on Derrick May, MK on Kevin Saunderson and more.